Happy December everyone! I really can’t believe it’s the last month of the year. In fact, if it weren’t 34 degrees when I woke up, I wouldn’t have believed it. But it’s definitely that time of the year–when the weather gets a tad bit nippy (ok, or cold), the holiday decorations are out in full force, and my thoughts turn to dreams of chocolate and cookies and pastry and everything that’s not necessarily good for me but keeps me going through the winter months. When I was growing up we didn’t have much money, but we definitely had traditions. One of the traditions was that on the first day of the month my mom would always say “Happy December” (or whatever month it was) and surprise us with a little gift–normally funky, colorful socks for me. The gifts were always something she got on super clearance the year before–you know, the 90% off Christmas or Halloween decoration bin–but I didn’t care. Any day is a good day for twinkle toe socks. So in the spirit of “Happy December!” I’m giving you guys my first attempt at gluten-free non-pie goodness: Mexican hot chocolate cupcakes. The recipes are adapted from various VCTOTW recipes, but I added my own flair as I went along. Because I milled my own quinoa and millet flours with my coffee grinder (seriously, best trick ever for cheaper gluten-free baking), the cupcakes had a grainy texture. But I didn’t mind it so much and neither did the testers, including a pastry chef, so, hey, they’re not perfect, but they’re pretty darn close. The cinnamon and cayenne pepper give the cupcakes the perfect chill fighting kick and the super rich chocolatey base makes them the perfect holiday treat. I’ve enjoyed reading and seeing everyone’s Thanksgiving feasts (I just roasted some veggies because I was so over Thanksgiving by the time the day rolled around) and I can’t wait to see what everyone whips up this month! Anyone have any exciting baking project plans? If so, I’d love to hear about them! And if you have any gluten-free requests for recipes, send ‘em my way and I’ll see what I can do. I’m always looking for fresh inspiration. And again, Happy December! And if you’re looking for that perfect Christmas or Hanukkah gift (or just a way to beat the cold yourself), check out Ricki’s Matcha Source giveaway! Preheat oven to 350 and oil a muffin tray (or line with cupcake liners). In a large mixing bowl or in the bowl of a stand mixer, combine the coconut milk, oil, sugar, extracts, and melted chocolate and mix on medium speed to combine. Add the tapioca starch and flax seeds and mix for one more minute until emulsified. Add the cocoa powder, rice flour, quinoa flour, millet flour, baking powder, baking soda, salt, cinnamon, and cayenne pepper. Mix on medium-high speed for two minutes until well combined. Fill the cupcake tin three-quarters full and bake for 20 minutes, until a knife inserted comes out clean. Place the baked cupcakes on racks to cool. While the cupcakes are baking, bring the 1/4 cup coconut milk to a boil in a small sauce pan. Remove from heat and stir in the chopped chocolate to melt it. Add the agave nectar and mix till smooth. Set aside to cool to room temperature. After the cupcakes have cooled completely, glaze with the chocolate ganache. Makes 12 regular size cupcakes or 24 mini cupcakes. That cupcake looks absolutely PERFECT! I have to admit that when I read, “34 degrees,” I immediately thought, “wow, how hot–lucky gal!” before I realized you meant FAHRENHEIT! And I love the idea of monthly little gifts. I think I’m drooling a bit over here! 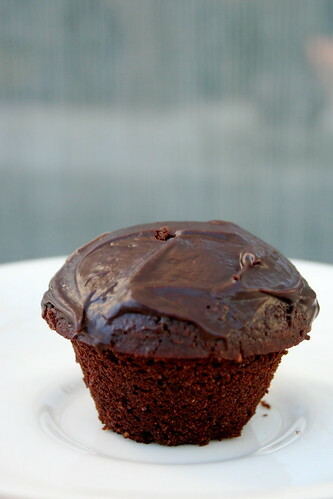 A nice spicy, chocolate cupcake would be the perfect thing to beat the winter blues. I also love to mill small grains in my coffee grinder….especially because most of those gluten-free flours are not available here. So I guess I do have all the equipment to make these very delicious sounding cupcakes! Ohman, I just made Mexican hot chocolate cupcakes for our Christmas party, and they came out way too hot. It looks like you use about half the cayenne that I did, so bet that these are totally perfect! your gluten-free mexican hot chocolate cuppies are maaaaaarvelous looking! i can’t wait to give ‘em a go! it’s getting coooooold here, too – and i’m with you on craving all things chocolate, cookie, and pastry-like. yum! i think i’ve had hot chocolate almost every day for the past week or two. w00t! happy december to you too, Jes! ooo, I wish that cupcake was sitting on my desk right now instead of on the monitor It looks so good! I bought some totally absurd made in china Christmas socks at Walgreens last night! We are kindred spirits! The cupcake is gorgeous! I know most people prefer the light texture of white flour, but I love the tastes and textures of the alternative flours. And of course I LOVE chocolate! Great recipe, Jes. I wish I had this before Thanksgiving when some vegan friends came to visit. I will definitely save it for future use. I love chocolate and spice together. The cupcakes look perfect to me! I’m always on the lookout for GF treats and these look amazing! Thanks for this recipe!